You are encouraged to make an appointment with your primary care physician as soon as possible. Call your doctor’s office – click here for a list of our doctors’ locations with phone numbers. Click here to view profiles of our Internal Medicine and Family Medicine physicians available as primary care physicians through your health plan. 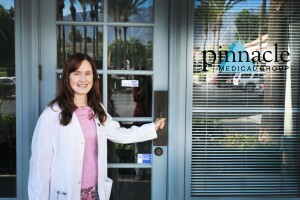 They are located in private offices offering award-winning personal service in Redlands, Yucaipa and Beaumont. If you have an HMO or POS plan, you must call your health plan to select a Pinnacle Medical Group primary care physician. Then you will be able to use all of the services available to you as a new patient at Pinnacle Medical Group. Usually, you must request a physician transfer by the middle of the month for the change to be effective with your insurance by the first of the following month. Make sure to have your medical records transferred over from your previous physician so your doctor has your complete medical history. Pinnacle’s primary care physicians oversee all aspects of your health care including physical exams, preventive care and referrals to specialists. When you need care after-hours, you have access to several urgent care centers. Click here for urgent care information. An secure online patient portal is available for you to make appointments, securely message your doctor, request refills and view your medical record online.